Burnley's Jack Cork keeps a close eye on Ruben Neves at Molineux earlier in the season. There's plenty riding on Burnley's game against Wolves in the Premier League this weekend. The fixture against the Europa League hopefuls will be the penultimate time this season that Sean Dyche's side take on opposition outside the top six at Turf Moor this term. After facing Nuno Espirito Santo's FA Cup semi-finalists, the Clarets' next home game is against Cardiff City in what could turn in to a direct shootout for survival. With just two points separating themselves and the Bluebirds at the bottom end of the table, Burnley come into this game knowing nothing but a win will do as they look to stave off the drop back down to the Championship. Dyche’s side were below standard in the first half of the season and without a good run of results, boosted by the return of England international Tom Heaton, they may have been staring relegation in the face, becoming favourites to join Fulham and Huddersfield Town. With a solitary win in their last five games the international break came at a fantastic time for the Clarets, giving them a well-needed rest and a chance to regroup and rebuild ahead of this huge game. Dyche will surely be looking for a better performance from his team after a tired display against 10-man Leicester City last time out. Wolves are set to prove a difficult challenge, however, as they are enjoying an outstanding first season back in the top flight. They have taken four points off Chelsea this season, beaten Tottenham Hotspur at Wembley and taken points off Manchester City, Manchester United and Arsenal. Despite this, though, they have struggled against the so-called 'smaller' sides, with losses coming against Neil Warnock's men and the Terriers. They also come into this game on the back of a poor run of form which has seen them win only one of their last five league games. When Nuno took the reigns at Wolves at the end of May 2017, the Wanderers were looking at ushering in a new era at Molineux. After a below par finish of 15th in the Championship previous boss Paul Lambert was dismissed. However, no one could have predicted the success of Nuno’s side in the following season as the gaffer brought in stars such as Ruben Neves and Diogo Jota from Porto and Atletico Madrid respectively. Wolves then coasted through the Championship under Nuno’s guidance and acquired a quite remarkable 99 points on their way to the title and promotion to the Premier League. The Portuguese boss won the Manager of the Month accolade for November during their promotion season and the Manager of the Year prize in his first year in English football. His achievements were rewarded with a new three-year deal at the club. The former Valencia and Porto boss then went on to win the Premier League Manager of the Month award for September as his team enjoyed an unbeaten spell, which included a win over the Clarets. Nuno is enjoying his best win percentage in his short managerial career with a magnificent 50 wins in 89 games and due to this form he is attracting interest from some of the world’s biggest clubs, including Premier League rivals Chelsea. Neves shocked the footballing world when he moved to Molineux from Porto in July 2017 for a then club-record fee of £15.8 million, as he had much bigger offers and was being classed as one of the biggest young talents in football. His class was clear to see in the 2016-17 Championship season as he was consistently putting in fantastic performances in his first season in England. He was nominated for both Player of the Year and Young Player of the Year, however he missed out on both awards to Fulham’s Ryan Sessegnon. Despite this, Neves was named in the Team of the Season and notched a hat-trick of club awards which included Player of the Year, Players' Player of the Year and Goal of the Season for his spectacular strike against Derby County. Neves signed a new contract with the club at the end of last term, a deal which will stretch until 2023. The midfielder has adjusted brilliantly to life in the Premier League, scoring a brilliantly-placed free kick on the opening day against Everton and showing that he belongs with the best with fantastic performances ever since. Raul Jimenez is another star from Liga NOS acquired by Wolves as he joined at the beginning of the season from Benfica. Jimenez struggled to adapt to life in the Premier League as he scored only two goals in the first two months of the campaign. But, since then, he has had the desired effect that Wolves were looking for when he was brought in, notching 10 goals and playing a key part for Wolves as they look to emulate Burnley's seventh place finish last term. The Mexican forward has not only contributed in an attacking sense this season, but he has also been fantastic defensively for Nuno’s side with 25 tackles, 17 blocked shots and an incredible 62 clearances for a forward. With great hold up play and a tendency to play key passes, Burnley must ensure that they keep a close eye on the now joint-highest Premier League goalscorer for Wolves in a single season. Wolves overcame the Clarets in the previous meeting between the two sides with a dominant performance, against what the BBC called a ‘lacklustre’ Burnley side. The home side's dominance was shown as they recorded 30 shots to Burnley’s seven, with the visitors barely threatening Rui Patricio’s goal throughout the 90 minutes. Sean Dyche claimed after the game that “Attacking-wise we were nowhere near good enough” and he wasn’t wrong. In the first half Wolves didn’t give Burnley any room to breathe as Jimenez had a number of chances to put Wolves in front, one of which was spectacularly denied by former England stopper Joe Hart. Hart was a busy man in the opening 45 as he was also forced to deny a cross-shot from Helder Costa. However it was James Tarkowski that Burnley had to thank for a fantastic double block to keep out Jimenez and then the follow-up from Spanish wing-back Jonny Otto. Defender Willy Boly had the final chance of the half as he volleyed over from Otto’s cross and as the half time whistle was blown it was a miracle that the Clarets weren’t already behind by three or four. 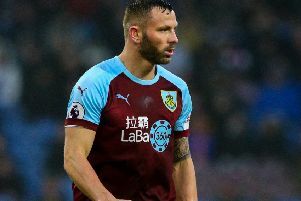 Unfortunately for Dyche’s side this didn’t change as in the first minute veteran right-back Phil Bardsley’s awful back pass gifted Jimenez a golden opportunity to score. However, the forward scuffed his shot wide. The one-time Benfica frontman, who has netted 17 times for his country, only needed one more chance to open the scoring as he flicked home Matt Doherty’s cross on the hour mark. The Clarets' only real chance of the game came shortly after this as substitute Matej Vydra’s superb volley from a Johann Berg Gudmundsson free-kick fell inches wide of the target. Hart was called into action again in the final few minutes to deny Adama Traore and any glimmer of hope for the Clarets was lost when Icelandic winger Gudmundsson’s late free kick flew wide. In all Wolves deserved the win if not by more and Burnley’s poor start to the season continued.